Post news Report RSS	The Concept of "Innkeep!" Since I jumped back into regular development of this project a couple of months ago I've had a lot of time to think more about what the game might look like in its final form. Recently a few more pieces of the puzzle have started to fall into place, and I'm quite convinced I'm on the right path. So I thought I might introduce what my current concept of the game is, so you can better know what to expect. This is what I wrote in my first development blog post, on December 23rd, 2014. Hello there. I’ve decided to try and make a game in my spare time using Game Maker Studio. It’s probably going to be called “Innkeep!” The “!” is because that’s what people will be yelling at you, before following up with “More ale!” or “Bring me some food!” It will be about running an Inn in a fantasy setting, dealing with the steadily increasing demands of various adventurers, travelers and ne’er do wells who drift through. Keeping all of your different plates spinning while also being flexible in dealing with some randomness will be the core of the game experience. I liked the idea of a fixed location (less work for a single developer! ), but with various interesting characters coming through. A slowly ramping up level of difficulty, some sim elements, but an experience closer to Papers Please than to a proper simulation/management game, with the core game mechanic interweaved with a nice little narrative structure. It would be a fun, intimate game experience, stretching over maybe 5-10 hours for most people. Short. Relaxing. Pretty. A couple of months later I wrote about what I thought the core game mechanic would be. Finally, what of the actual game play? The core game mechanic will be organizing the incoming types of the guests in order to extract the maximum possible amount of money from them. Economic survival through a couple of months is success. Although it might come at a cost (narrative). The bar in the common room functions like a “landing strip”. Four or five slots. From here you can also assign people to rooms for the night via a guest book. Guests can drink at the bar, but they will want to go and sit down fairly soon. They are a little like the next tetris piece which is going to fall, or the card you are holding in reserve to see how things play out. Each table has a limited number of spots, and here is the main challenge. Who should sit next to who? Guests will stay longer if they have someone to talk to and if they like that person, less if they dislike them. As the days progress you are introduced to new types of guests: Peasants. Peddlers. Merchants. Ruffians. Adventurers. Soldiers. Etc. They all have likes, dislikes, and indifferent relations to the other types, so you will have to study up in order to cleverly balance the tables to produce maximum income. So I had a setting. And some idea of what the main gameplay would be. Then, that same month, a fellow named Scriver over at the Bay 12 forums shared the following video from Les Miserables, suggesting it was a good theme for the game. Have a watch if you can. I've never actually seen the movie, but this part is brilliant. And the character was very interesting. A rouge. A scoundrel. A thief. But beloved. He isn't "dark" in an annoying, morose manner, like a lot of anti-heroes. He is comical. Cheeky even. Right away I thought that this would have to be what I was aiming for. Maybe with slightly darker undertones, but never so much as to overpower the playfulness. And that's where things stopped for a while. In the middle of 2015 just before I took a long development hiatus I wrote another blog post about where I might take the game, and then deleted it after changing my mind. The idea I had, after reading a great Manga called "dungon meshi" (delicious in dungeon) was that your inn could be a place where adventurers form parties, go out on quests, and then come back with their loot. You would be organising people around tables not simply for profit day to day, but with the bigger picture in mind - helping the adventurers make more money, so that they could in turn spend it at your establishment. The game world outside your inn would exist in the form of a map, and you would find out about different dungeons and places that you could send persistently existing adventurers too. It felt like a great idea. And then I ran into trouble the more I thought about it. 1. It was ambitious. It would require a lot of design to come up with a way to handle all the different mechanics for adventurer generation, party behavior, questing, etc. 2. It didn't fit well with my thieving innkeeper thematic. Was I helping my guests? Or stealing from them? If I was stealing, that might prevent them from doing well in their next quest, and so I would undercut them. It didn't quite "fit" well. And what then about the whole "organizing guests around tables" mechanic idea? If guests were persistent, and half of them adventurers, then I would have a completely different set of long-term mechanics intermixed with mechanics designed for day-by-day short term challenges. What I had, in other words, was a good idea for a game, but not the game I had already set about making. Did I really want to swap over to something else that was even more ambitious? I decided not to. But, funnily enough, half a year later somebody else appeared with almost exactly the same idea! So maybe I was lucky I didn't decide to start doing something only to be beaten to it by a proper team of developers! After dropping the idea of the adventurer team management concept and focusing on the basics, things progressed slowly as I tinkered with coding stuff and getting on with IRL things. I wasn't really forced to think too hard about game mechanics when I was still building some of the very basic supporting frameworks, such as selection code, path finding, guest/table allocation and so on. Then, a few months ago, I started to get back into the project more seriously after another long break. I did a bit of work implementing loading and saving, a morning/evening time phase, and a few other neat little improvements. I even did a rough storyboard of the intro, with the main character shown at the beginning looting some bodies at a battlefield (just like the character in Les Mis, who "was at waterloo", picking the pockets of the English dead). 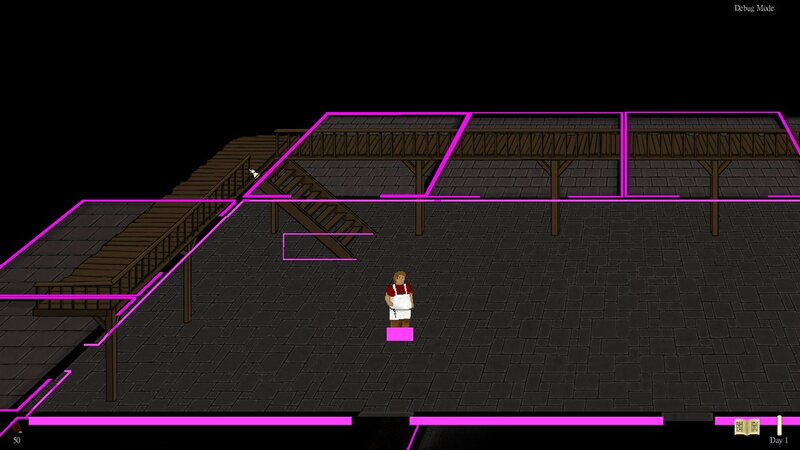 But following that I decided to focus my energy for a few months on actually properly building the interior of the inn. A lot of poor design decisions in the past meant that the interior was just not really at the level that I wanted it to be, even for prototyping. Both the art and the way pieces fit together needed to be redone from scratch. 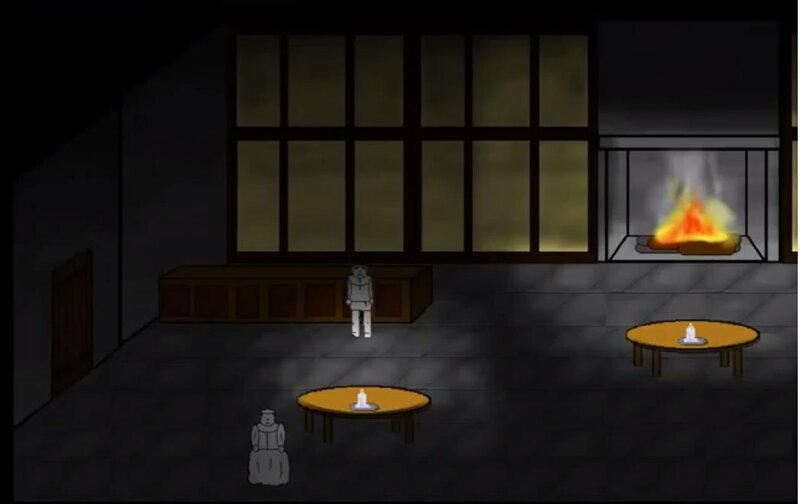 I also thought, and looking back I was right, that if I focused on building the interior properly it would help me maybe see what the game was going to really be about. In what way would my character be a thief? And how would that connect with the whole "helping guests be merry" mechanic of organizing people around tables? As I built the interior I just knew that I had to be able to go inside the guestrooms. They couldn't just be doors that you clicked on, existing only as abstractions. The fun thing about the perspective I am using is that it feels like you are peering into some kind of doll-house. Being able to go inside the guestrooms would play into that, and just be nice. It worked, it fit. But... where would this connect with the game mechanics, and the game theme? What exactly was the -purpose- of going in the rooms, except to upgrade them? As I wasn't making a sim with a 24 hour clock, I wouldn't be micromanaging the inn, watching the guests go to bed, sleep, bath, etc. etc. It would get late. And that would be the end of the day. And rooms aside, what was the point of this game being about an "inn" rather than a "tavern" if renting rooms didn't connect in any real substantial way to the "organizing tables" mechanic? Then I finally figured it out. The game will have a third day phase, after the morning and evening phases. This is the "night" phase, or rather, "deep night" phase. All the lights are out. The guests are in bed. And you have just your little candle stick and nightcap on, like scrooge (and I already even had a candlestick motif used for the menu system). The inn will be dark. Just a little circle of light around your character. And that key at your side? Well that's the master key, that opens all the bedrooms. Inside, the sleeping guests, at your mercy. And the connection with the game mechanic of encouraging guests to be merry? Well, if you are going to be rummaging through the backpacks of an adventurer you want them to be as drunk as possible! So, the game in fact will have two layers. Secondly, while doing this you are actually keeping an eye out for rich patrons. You are listening to conversations to find out if some adventurers did well in their last dungeon, or a merchant made big in a deal. With your mark located, you can focus all your effort on getting this character to have a good time. (This might become increasingly challenging as the game progresses, in proportion to the rewards to be had.) With the guest sufficiently drunk, you know you have a good chance of not alerting them when you visit later that night. You can't very well rob everybody without arousing suspicion (I can put some restrictions in with time, or even a "suspicion meter or something abstract), so you need to pick and choose. Then, you have a chance to find something really nice maybe. A haul of coins. Or a pretty trinket you can pawn. Or maybe even something useful in your inn, like a powerful spirit for putting in other peoples drinks, or some rare spices for your kitchen to help disguise the suspicious contents of your stew. And just like that we have linked together the core of the game with the inn being an actual inn with bedrooms, while also developing the initial theme of the main character as a rascal. Something I particularly like about robbing your guests is that it should be rewarding for the player. There is something to be said for the rewards of a simulation with deep levels of management and complexity. But that's not something I can offer. But with simplicity comes the risk of monotony. You give a guy a beer. He gives you five gold. You get a bunch of people to drink more than they otherwise would due to some clever seating arrangements, and you get somewhat more gold. A bit of a challenge? Maybe. But fundamentally a known quantity. Even if you spice it up with some brawls and so on it is missing something. But robbing an adventurers backpack in the middle of the night? Hello RNG. You never know what you are going to get. And that's what makes it so fun. As much as I have the time or desire I can make a whole range of neat little pixel objects for the player to find, of varying degrees of rarity, and of more potential use than just gold. An uber rare dwarfen spirit that makes a person go blind? That's a fun and interesting reward that can link to further game experiences. Maybe you can use it on somebody who is super resistant to alcohol, so it's something you keep in reserve for later challenges. Even just various pieces of treasure that you exchange for substantial amounts of gold could be more enjoyable than just earning the stuff. And because you never know what you will get, you always have something to look forward to. Importantly, it isn't just randomness that gets you that reward. You have worked for it. You have identified your mark through close observation of your patrons. And you have used techniques to get that character as drunk and merry as could be. Then when you get your nice reward, you really have earned it. Unlike my earlier idea of an adventurer team management game (which is a good idea, and I look forward to seeing what the Epic Tavern guys do! ), this idea stays true to the theme and scope of my original conception for Innkeep! It ties everything together, and enriches what I think was already a nice concept. It makes me excited to play the game, really. I want to have a shot at it! Which is a good sign. There are all kinds of ways that I can continue to flesh things out and add detail here and there. But I have a real feeling that I have now arrived more or less at what will be the final concept of the game. I'm really looking forward to what the next year of development will bring. Hopefully I will have a little demo for people to enjoy some time in 2017. In the meantime, I will continue to release development videos on my youtube channel whenever I have something substantial to show. The next one will showcase the new interior of the inn, and will be due pretty soon (late October I think).